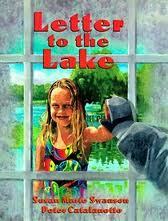 It is very cold outside and Rosie and her mom have to scrape the frost off the window of their car, but memories of the warm summer days spent at the lake picking raspberries, chasing dragonflies, rowing in the rowboat and collecting rocks helps her get through that cold miserable day. 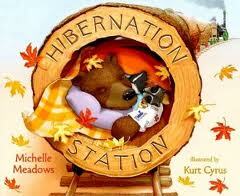 Children are fascinated by the fact that some animals go to sleep for the WHOLE winter. 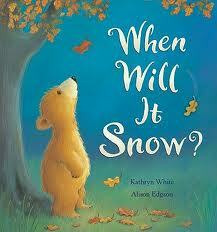 I liked this book because it not only mentions bears, but many other animals that hibernate that we may not think about. I love that this story rhymes and I think many children will also identify with some of these animals who are having a hard time going to sleep because it’s too dark or because they need a snack or a drink before they fall asleep. What if snowmen could stay with us all year? We could fly kites with them and take them to the beach. We could go camping with them and catch fireflies in the summer. 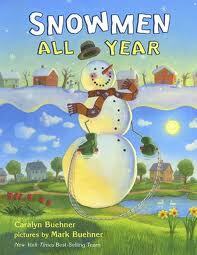 A very cute rhyming book about all of the fun things you could do with your snowman if they could just figure out a way to stick around past winter. Mrs. Bear sets her alarm clock so she doesn’t sleep through Valentine’s Day again this year. She digs up the honeypot buried in the snow, sets out a bowl of crunchy dried beetles (Mr. Bear’s favorite) and gets out the Valentine cards she made in the summer. The hardest part is waking up Mr. Bear from his winter slumber. 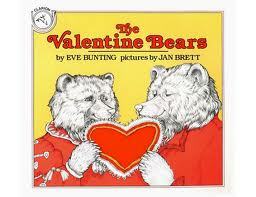 It turns out that Mr. Bear had been preparing for Valentine’s day, too. After sharing a special day together they settle into their den for the rest of the winter. 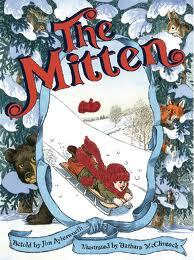 The classic tale of a boy who loses his mitten while gathering wood in the forest. 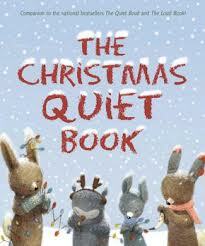 Several animals, including a mouse, a frog, an owl, a rabbit, a fox, a wolf, a wild boar and a bear all squeeze into the mitten to keep warm. It’s only when a cricket tries to climb in that the mitten rips in two. The boy does finally find his mitten, but luckily his grandmother makes him another pair. There are many versions of this story and they all contain a mitten and a bunch of animals trying to get into the mitten to get out of the cold snow. This version is a little different than the uber-popular Jan Brett version in that the grandmother in this story is more than happy to make her grandson a new mitten and the grandmother in this version also doesn’t make the mitten the same color as the snow. It would be fun to read several versions with your child and see how the stories and the illustrations compare and contrast. Being able to make connections between books is a great reading skill for children to have. Okay, this book about made me cry. It is SO sweet and is such a good example of doing for others and not asking for recognition. LOVE it! 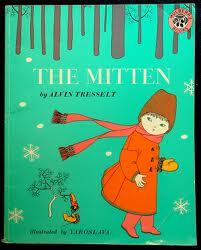 Sarah, an elderly widow, notices a boy dressed in blue at the bus stop who has no mittens. She knits him a pair of blue mittens and hangs them on the tree by the bus stop. He finds them and is then able to throw snowballs with the other kids. Then Sarah notices a little girl who has mittens that don’t match, so she goes home and knits a pair of mittens for her and hangs them on the tree. She knits and knits and knits and soon has enough to fill up the tree with mittens for all the children, but her knitting basket is empty. Somehow though, someone figures out she is the one knitting the mittens and leaves a surprise for her on her front doorstep. Super sweet!